Make your way to the Lost Farm Restaurant for a romantic dinner for two over premium Tasmanian produce; fresh seafood, award-winning beef and a sensational selection of bubbles and wine. Wake up to the sensational vistas of the Barnbougle Golf Links courses or look a little further across to Barnbougle beach and Bass Strait. Make your way to breakfast at Lost Farm Restaurant. Head out on course to play 18 holes at Barnbougle Lost Farm. Designed and executed by Coore Crenshaw, Lost Farm sits on the same track of land as The Dunes and shares her splendour and beauty, but golfers will no doubt be relieved to hear; has been “turned down” in difficulty. It still rates in the Top 40 and the more generous fairways offer a respite for every golfer. Lost Farm features 20 holes, all of which are playable during any given round and boast beautiful views along the coast, and into the Tasmanian hinterland along the Forester River. The course’s distinctive undulating character, wide-open fairways and exquisite hole layouts provide a tough, yet fair challenge for golfers of all abilities. In addition to some of the best golf in the world, Lost Farm offers world class dining and accommodation facilities. The restaurant at Lost Farm dishes up a delicious array of Tasmanian produce, from succulent seafood to locally grown beef. Lost Farm is a truly breathtaking golf course that compliments the surrounding landscape and is a genuine treasure of Tasmanian golf. Enjoy the view from the Magnesium hot pool overlooking the water or select a treatment from the extensive spa menu. Venture out to Launceston’s iconic restaurant “Stillwater” for contemporary Tasmanian cuisine. Settle back in to your room to prepare for the next day’s play. Wake up early to the sensational vistas of the Barnbougle courses or look a little further across to Barnbougle beach and Bass Strait. 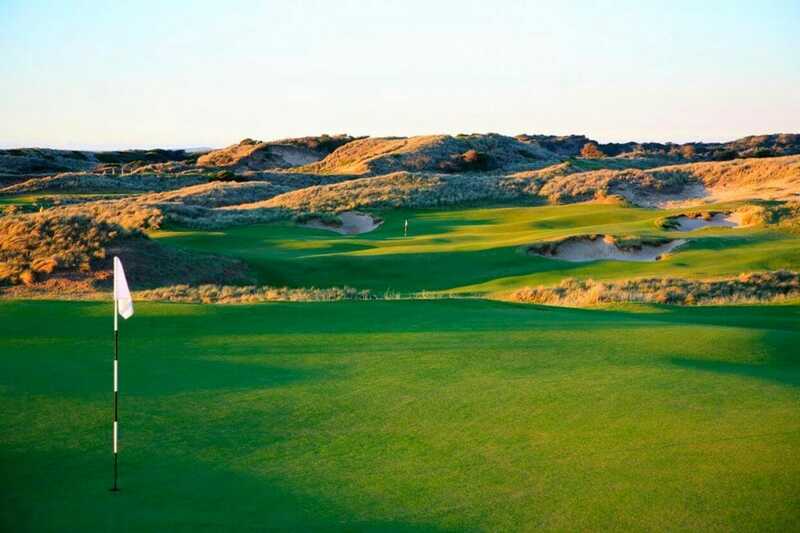 Head out on course to play 18 holes at Barnbougle Dunes. Barnbougle Dunes opened in 2004, the realization of potato farmer, Richard Sattler’s, vision. The strip of coastal dunes was entrusted to acclaimed architect Tom Doak, charged with creating something special. What he produced was nothing short of a masterpiece. Standing on the first tee it is easy to underestimate the beautifully brutal challenge of the tyrant golf course that lies ahead. Forget for a moment the rolling fairways, cavernous bunkers and swaying rough. Study the entire landscape. Soak up the traditional Australian palette of green and gold. At this point, hitting the ball is superfluous for the enjoyment of golf. Consume those words with the understanding that this 18 hole monster of a golf course was ranked #11 in the World Top 100 by US Golf Digest Magazine (2015) and #42 in the World by US Golf Magazine 2017. Not one hole will let you off the hook. You will use every club in your bag and have wished you had another five at your disposal. Head off an hour’s drive to the Josef Chromy vineyard for a late lunch and explore. Drive directly to Launceston airport for your flight home.